To obtain correct shower water temperature, hot and cold water are combined at the shower mixer tap. Both have different origins: hot water comes from a heating device, for example from your electric or gas water heater, and cold water comes directly from the mains. Depending on the temperatures of cold mains and hot water, you will sometimes need a greater volume of hot water to be mixed with cold water in order to achieve the desired shower temperature. Easily installed under a shower tray or a bathtub, the ZYPHO utilises the heat from the hot water flowing down the drain. Water entering the ZYPHO will transfer its heat energy to the copper pipe with cold mains water. Cold mains water going through the copper coil of the ZYPHO will, in turn, absorb this heat and therefore become warmer. After having passed through the heat exchanger, cool drain water then exits into the drainage system. Preheated water goes to the shower mixer and, consequently, a smaller volume of hot water from your heating device is needed to reach an appropriate shower water temperature, which literally means that less energy is used. The ZYPHO is a safe and clean system where hot shower waste water and cold water supply never mix. While allowing for easy maintenance and cleaning, its unique design also prevents pressure loss and leakage. 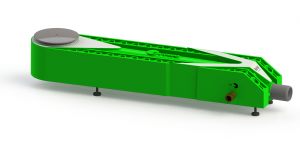 The ZYPHO is distinguished by its exceptional reliability and durability due to the use of high-quality materials and a technology based on physical principles which are, despite their simplicity, innovative in this field of application. The ZYPHO can recover up to 15°C from the shower drain water, which results in around 40% energy savings. With the ZYPHO, cold water coming into your mixer tap and/or to your water heater arrives there already preheated up to 25°C, i.e. an increase of about 15°C (depending on installation configuration and shower flow rate). ZYPHO’s high heat recovery efficiency allows to an average family with 3 daily showers to save over €200 annually. Compared to the unit’s reasonable price, these savings allow getting back the investment in less than 2 years. If in your family showers are longer or hotter or more frequent than average or if you have a rain shower instead of a normal one, you will certainly be saving even more. There is no doubt: ZYPHO is one of the easiest and most cost-effective improvements that you have ever been able to make. Installing the ZYPHO is surprisingly simple. It is similar to installing a typical commercial shower valve and connecting normal plumbing piping. HERE you can request installation guidance. The efficiency values obtained at tests performed by the independent certification body KIWA Netherlands account for up to 32.5% of heat recovery. At the same time, real showering conditions would often be different compared to KIWA test conditions. Therefore, depending on flow rates and temperatures of hot and cold water, ZYPHO’s actual efficiency can go exceptionally high – up to 80%. The ZYPHO’s internal copper pipe (certified according to EN 1057) is of a constant diameter and does not have any internal joints and dead spaces, which avoids undesirable pressure drop and leakages while minimizing Legionella-related risks. In those countries where EN 1717 is mandatory, double walls must be used to separate drain water and fresh water. 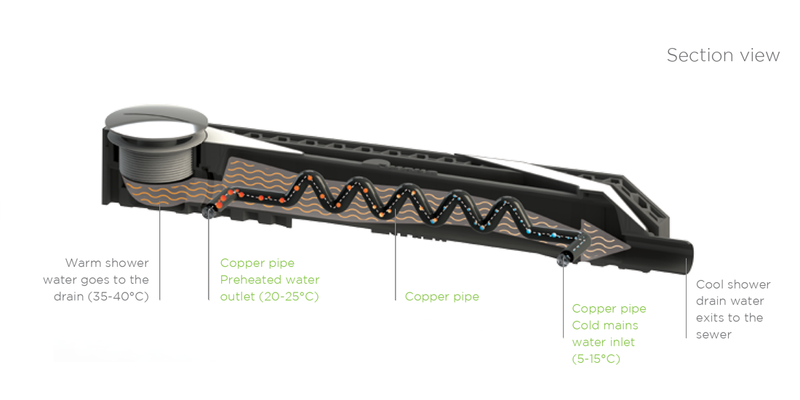 Designed to comply with these regulations, the heat exchanger of the ZYPHO 8kW double-walled is made by squeezing two copper pipes against each other, which creates a very robust and consistent structure where the contact between the pipes does not depend on water pressure.